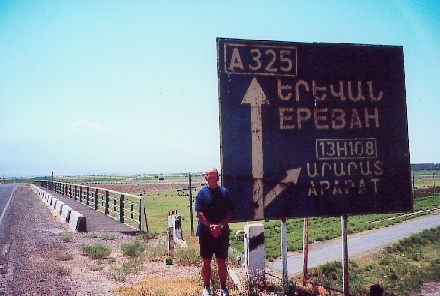 Always looking for high mountains and passes higher than 2000 meters, Charly, my French bicycling partner, travelled to Armenia in the summer of the year 2000, and I accompanied him. Here is my translation of his report. Armenia, do you know it? Is Armenia a people or a religion? We forget about the strong sentimental or familial ties that unite us with this small, distant country (the size of Belgium) in the Caucasus, bordered by Europe and Asia. Who doesn't have, among friends and acquaintances, a good friend who is Armenian? Armenia is not well-known to western travelers, who lack sufficient information to discover this former Soviet republic whose population is 3 500 000. 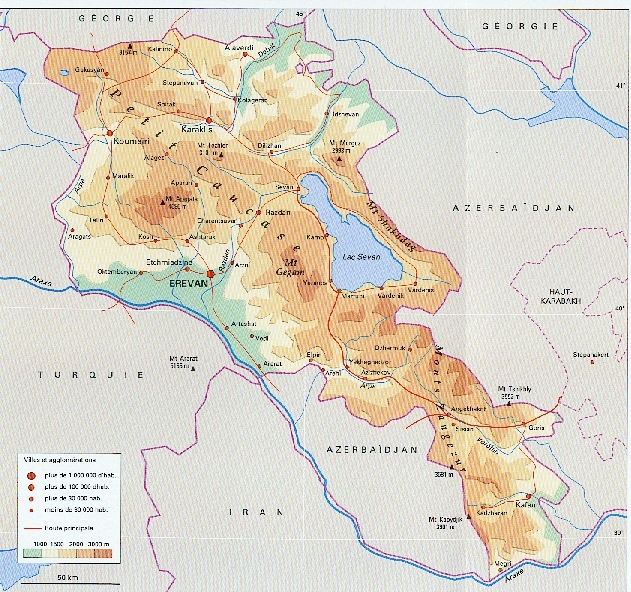 Armenia is a country of mountains, served on a high plateau, bristling with extinguished volcanoes, and circled on all sides by the powerful mountainous systems of Asia minor, Persia, and the Caucasus. 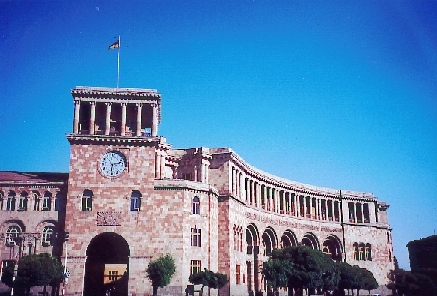 It has its economic "lung", Erevan, the capital, whereas the rest of the country is a tangle of mountains higher than 3000 meters, notched with deep valleys. Who says "mountains" says "passes" (obviously), and the small area of the country allows us cross it from top to bottom. The program consists of 10 stages, the first week autonomously (totally by bicycle), and the second, climbing passes but travelling the long distances between them via auto; 14 passes, of which 12 are higher than 2000 meters. For a travelling companion, I roped Barbara into sharing this unusual adventure. One day late (because of an air traffic controllers strike) we take off at 15h30 for Armenia aboard a Tupolev (rather rustic) replacing Monday's Airbus, surrounded mostly by Armenians from various countries. After four and a half hours of flight, we land in the starry night. It is 22h30 (19h30 in France) and the temperature posted is 27° C (80° F)! Customs formalities pass like a letter at the post office, but retrieving our luggage is rather crazy. Next, we are transferred by shuttle to the heart of the capital, to Erebouni Hotel, built in the typical Soviet style (500 rooms). But my heart isn't in it. Unpacking my bicycle, I see that the rear derailleur dropout is very bent. I unbend it as well as I can, but the damage is done, and after a lot of adjusting, the results are almost definite: I can't use the large chainring. Oof, I didn't want to make this whole trip in the minivan that we will reserve for the second part of the trip. For Barbara, no equipment problems, and it is 2h30 (!) when we finally go to sleep. A beautiful blue sky and temperature more than 30° C (80° F) for the first day. On the morning's program, reserving hotels and the minivan with driver for the rest of our stay (the second week), at one of the country's most dynamic travel agencies (Prana Tour). Then we start this short stage in the stifling afternoon of Erevan (altitude 1000 m), in the midst of polluting traffic, on atrocious roads. At the edge of the city, the traffic disappears and the very wide, well-paved road reassures us. As for the countryside, it is not very radiant in spite of a beautiful view of the snow-covered mountains. Achtarak (altitude 1100 m) is in sight, nested in the green of the orchards on both sides of the river Kasakh, which has impressive gorges, and enjoying a pleasant climate, a restful and scenic framework. We look in vain for the rather luxurious hotel where we planned to stay, so we settle instead for the second choice: a large, dilapidated building in the Soviet style, where we have problems with the water, but in Armenia, it is a common occurrence. As for dinner, at the end of the river valley we find an open-air restaurant, one of the best in the area, a meeting place for the nouveaux riches of the capital, with all their paraphernalia (cell phones, Mercedes, and "babes"). Today, without luggage, we will make a loop in the back country of Gumri, (alt. 1500 meters), which is a high plateau surrounded by mountains. The Turkish border is only 13 km away, but we take the direction toward the north, toward the Black Sea in Georgia. The road, well-paved and wide at the beginning, becomes more and more narrow as we climb toward the mountainous summits. The sky, as usual, is azure blue, and the sun begins to take its toll. We leave the main road, with almost no traffic, to follow the Tashir route, normally paved on the maps, but which has become a trail with holes and holes. It is distressing. 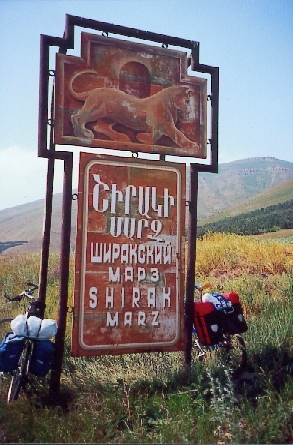 At the edge of the agricultural village of Musayelian, the climb to Karakrach Pass (alt. 2272 m) begins; an altitude change that is reasonable, but the difficulty is due to the atrocious road and the violent wind, which makes it necessary for Barbara to wait for me at the foot of the pass, since she is afraid of being blown away. Near the pass, the shepherds and their flocks welcome me with vehemence (an extraterrestrial is passing by). Returning the way I came, the descent is as fast as the climb. Barbara is still there (they have not kidnapped her), but she sulks because she seems not to appreciate the wind, the state of the roads, and the vicious dogs attracted by her tasty flesh. To get to the second pass of the day, we cross the phantom village of Amasija, where the earthquake did enormous damage. Barbara waits for me at the neighborhood refreshment stand while I climb the pass, which culminates at 2214 m. At the summit, a military vehicle stops me for a passport control (which is not funny) and I have to follow them to the military post in the village, where Barbara is already installed with an interpreter who speaks French. They don't seem to understand the goal of our visit in this sector close to Turkey, which would, in the current state of things, be a matter of improper voyeurism. Perhaps they are not yet aware that the Iron Curtain has risen. But things are sorted out with lots of questions (we are free, that would be all we needed!) in the "most open" country of the ex-USSR. The remaining 26 km to conclude the stage are appalling, a journey for a warrior, on a road badly damaged by the earthquake. Barbara will remember this. Early in the morning, we again take the road for Spitak that we took two days ago. We quickly "swallow" Jalur Pass (1952 m) in spite of the wind and the persistently rocky road. Not much traffic crossing this beautiful agricultural valley following the only train tracks that link Erevan and Tbilissi. At Spitak, I take a small detour to Bazum Pass (2559 m), a pretty climb in unspoiled nature, with a questionable road surface in places. Barbara, who prefers to rest, sees me reappear well afterward, and, to kill time, makes the acquaintance of a shopkeeper and her family. Again in the valley, and just before ending the stage, I give myself a last gift: Pushkin Pass (2037 m), named for Russian poet who stayed here. A climb with a lot of switchbacks (a distant cousin of the Stelvio in Italy) with impressive views from above. Returning the way I came, where Barbara, who refrains from doing this new climb, waits impatiently for me - - two hours late, I understand... Vanadzor (alt. 1350 m) (17 000 inhabitants) is near. Formerly Kirovakan, the country's third largest city, it had a little more luck than its neighbors at the time of the 1988 earthquake, even though it, too, was severely affected. 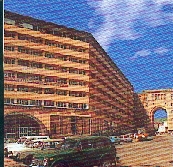 Our hotel, an immense building of Soviet design in the heart of the city, is dilapidated in a state of advanced decay. As for the water pipes, they are cut, so we wash ourselves in the old style, with water stored in the bathtub. Wide avenues, gigantic municipal buildings, grocery stores in shambles, is the principle picture of a large Armenian city of the ex-USSR. The people here, as everywhere, stare at us, or rather, at Barbara! That makes us feel uncomfortable because there is not even a pretense of contact. After an excellent dinner in the city's only restaurant, where the warm welcome and the service are surprising, we go to confront our beds, or rather, the mattress (our backs are again put to a severe test, which is usual here). Starting off with a flourish, because we climb immediately for 15 km to approach 2000 meters altitude. The countryside is alpine and predominantly green. On our right is the majestic profile of the long chain of the Pambak mountains, where you can guess from its spiny ridge that there are passes. Rightly so, after several pieces of barely passable road we turn off in the hollow of the valley to try to attain the summit of the crest at Margaovit Pass (alt. 2628 m). After the first several meters, the trail becomes worse. Barbara, who doesn't appreciate this terrain at all, won't ever be able to get her trail permit. She doesn't insist and, while waiting for me, takes a long rest in the shadow of a tree opposite an idyllic view. As for me, I progress, sometimes on foot, or with difficulty in the saddle, across the woods of pine and other aromatic plants. At the end of the greenery at 2300 m, the décor becomes rocky but not any less interesting. To conclude this climb I opt for walking...on foot, only slightly slower than in the saddle. At the summit at 2628 m (as high as the Galibier but much warmer) the extended view is grandiose. I rush down immediately at speed with a capital S on...Barbara, because I don't want her to worry, as she usually does. We finish the stage with a long descent in the valley covered with forest as far as the eye can see, but, unfortunately, we can't profit from this irreproachable nature because we have to be very attentive, the road surface is execrable. 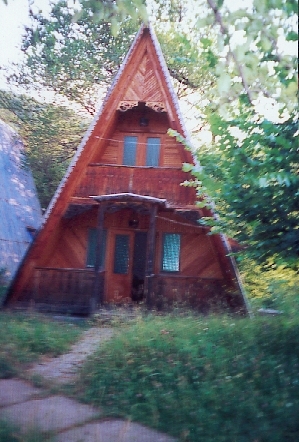 Dilizan (alt. 1300 m) is a cure center (or rather, was) as witnessed by the ancient, dying installations. 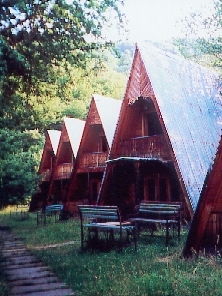 We take up quarters in a computer training center and lodge in a triangular hut with summary comfort. Western-style welcome, a hot shower (which isn't usually the case here), at the house of the director of this place, and a succulent dinner in the semidarkness to conclude the 5th stage, which starts to weigh heavily in Barbara's legs.